One of the reasons we love Seattle is because there are a ton of festivals throughout the year. But there is one festival that easily takes the cake over all the others, Seattle Seafair. Everyone in Seattle waits the whole year for this festival to roll around in July/August, and if you're going to be visiting Seattle around that time, count yourself lucky to be able to attend. So what makes Seafair such an awesome event? Well, that's a pretty easy question to answer. Everything. Yep, everything about Seafair is great. It's a month-long celebration for goodness sake! How could there not be something for everyone in the family? So the first thing to know about Seafair is that it isn't a single-day event. It's not even a three-day or week-long festival. Instead, it lasts a whole month. It usually starts towards the end of June and lasts through the first few days of August. Of course, it wasn't always like this. The first Seattle Seafair occurred in 1950 and lasted about ten days. There were parades, various athletic events, community festivals, and even a Milk Carton Derby boat race on Green Lake. This was before Seattle was a well-known tourist city, and the Seafair helped put Seattle on the tourist attraction map. Nothing much has changed since that Seafair. It now lasts a bit longer, but there are still parades, community events, athletic events, and even boat races. For example, there is the Torchlight Parade, which is the final parade marking the end of the Seafair Festival. There's also a Seattle marathon and triathlon held in conjunction with the festival. And boat races... well, we've got boat races! There's the infamous festival-opening Milk Carton Derby boat race that still takes place on Green Lake, as well as the super popular hydroplane races that attract thousands and thousands of spectators each year to the shores of Lake Washington. There have also been a few additions since that first one, including an air show performed by the Blue Angels, the Torchlight Run (to go along with the Torchlight Parade), as well as fireworks and concerts. 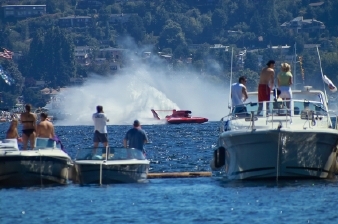 Now, the great thing about Seafair is that most of the events are free. However, there are some that require tickets like the hydroplane races, the Blue Angels air show, and even the Torchlight Parade (if you want good seats without staking out your spot the night before)! The nice thing, though, is that it's easy to get tickets. All you need to do is go to Ticketmaster.com and purchase them. They can be mailed to your house before you go and you'll be all set once you get there! Anyway, if you're planning your trip to Seattle and are fairly open on your travel dates, I would highly recommend trying to be there for at least part of the Seattle Seafair. There's nothing quite like it anywhere else, and your kids will love seeing all the crazy things that happen during the month-long celebration. Return from Seattle Seafair back to Seattle Festivals. Ever been to the Seattle Seafair?